Probably you’ve noticed, previously I reviewed several note taking tools. This post will give you flavor from all of them, such as: Cintanotes, Google Keep, Evernote, OneNote, Simplenote, SilverNote, and Beyondpad. Let’s start. 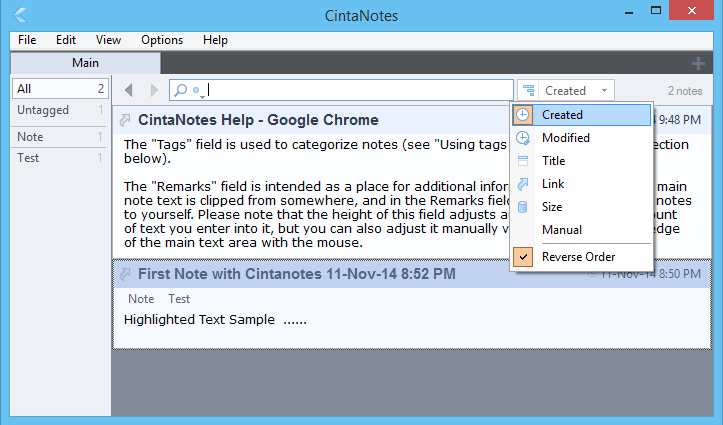 Cintanotes is a lightweight tool for taking and managing your notes. The app is only available for Windows PCs. It has both portable and installer versions. Also they offer paid versions beside free one. You can read more about its advantages here. Creating a new note is possible either by clicking the ‘New Note’ option from the ‘Edit’ menu or using shortcut. The program supports a range or hotkeys which can be found written beside the respective options. Unlike SilverNote, Cintanotes offers a separate title field where you can insert timestamp while editing. 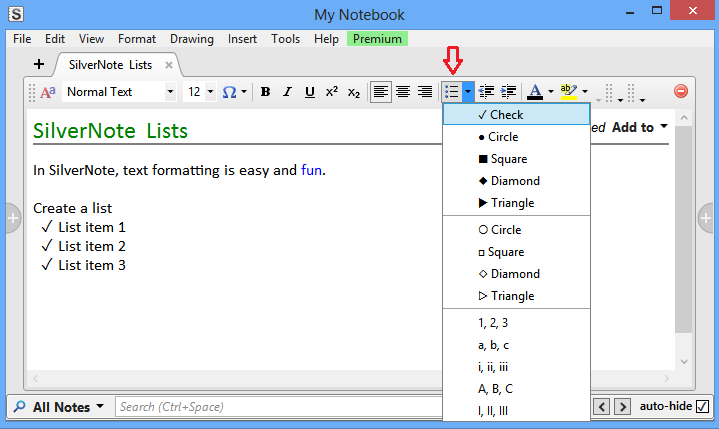 The context menu inside the note text editor box offers some limited formatting options. Cintanotes does not allow changing the text color or font. You can just get some basic functionalities like italic, bold, underline, highlight, strikeout, monospacing, bullet listing etc. Although you can’t paste an image on Cintanotes notes, but it’s possible to link files with note texts that can be opened by clicking on those hyperlinks. Note clipping is a useful feature which we found broadly in Evernote and OneNote. Cintanotes also offers a text clipping feature. Select your desired text on any application and press CTRL+F12 while Cintanotes is running on your computer. A new window will appear with the text inserted in a note. Cintanotes also sports sectioning, tagging and searching options. You can create separate notebooks for various purposes. The app has backup and export/import facilities so that users can move notes offline. Cintanotes contents can be synchronized online via Simplenote. It has no native sync feature. It needs a pro license to use this feature. Google Keep is a free note taking service offered by Google. You can use Keep on the web just by visiting https://keep.google.com. The tool has dedicated app for Android OS only (AFAIK there is no such thing as Google Keep for iOS so far) . There is also a Chrome browser extension that works somewhat like a desktop app. 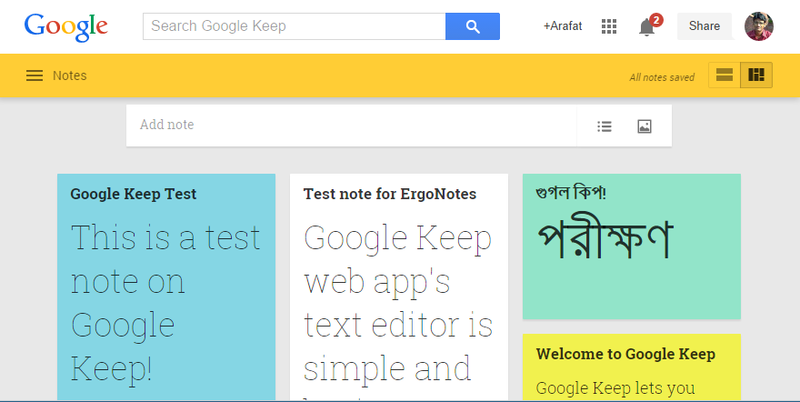 On the desktop, Google Keep’s web and Chrome extension’s user interface looks alike. It comes with a grid view by default. Creating a note on Google Keep is just a matter of few clicks. The service does not sport text formatting tools. There is no way to change the default font too. You can add a reminder, make a checklist, insert images, change the note background color and so on right from the note editor box. Recently Google has added note sharing option. Keep’s Chrome extension supports offline editing to notes. The changes get synchronized with server when the device goes online. The Android app brings some additional features like audio recording, location based note reminder etc. However, Google Keep offers fewer than other similar services like Microsoft OneNote and Evernote. You may not treat Keep as the replacement of these other tools that are loaded with much more features. At this point, I think Keep should be used in its own way- in basic level note taking needs. Evernote is a widely popular note taking tool. The service sports a greater range of platform support and a stream of features. Evernote has both free and premium packages. To use the service, first you need to create an account there. Evernote web version can be used directly from your browser. It also offers apps for Windows PC, Windows Phone OS, Mac, iOS, Android, Blackberry and WebOS. Its web clipper can be used with web browsers to save and manage web pages. Evernote has a good set of writing and formatting tools. You can insert photos, audios or other files in your notes. Certain parts of note contents can be encrypted with passwords as well. The service lets share notes with others so you can collaborate online. The free version of Evernote allows to upload maximum 60MB data per month. If you need more upload quota, try Evernote premium. The paid version costs $5/month or $45/year which is scheduled to be changed in early 2015. Evernote competes hard with Microsoft OneNote. Both of them are feature rich and have a growing user base. You can read our OneNote vs Evernote web app comparison for more information. Microsoft’s OneNote is another fantastic tool to jot down your plans and ideas. The service is free. All you need is to have a Microsoft account (e.g. Live, Outlook) to use it. OneNote apps are available on the web, Windows (PC and Mobile), Mac, iPhone, iPad and Android. If you have MS Office suite installed on your computer, then probably OneNote is also included in the package. Visit this link to download the app for your device. If you have experience with Evernote then you may find our Evernote vs OneNote comparison useful. OneNote offers lots of content formatting tools. You can customize your note text font, size, color etc. It has a rich drawing tool to illustrate ideas right away. Tags on OneNote are used in a unique way that will help you so much to stay organized. Its notebooks are also useful in this purpose. OneNote lets users insert images, sounds and other files inside notes. Unlike Evernote, It has no monthly upload limit. OneNote uses your OneDrive storage under the same Microsoft account. If you buy an Office 365 plan, more business features can be enjoyed in OneNote. The tool’s optical character recognition works just fine. You can grab texts from images as well as handwritings. As the name suggests, Simplenote is a note taking service having simple UI and convenient feature list. This free tool is offered by Automattic, the company behind WordPress.com and contributor to WordPress.org. Simplenote can be used from its web app. Visit http://simplenote.com and create an account to start with the service. Dedicated Simplenote apps are available for iOS, Android, Mac and Amazon’s Kindle devices. The service does not offer any text formatting tool. You need to add title and original note text inside the same field. There is no hyperlinking or image/file inserting option. Simplenote notes can be arranged/filtered using tags. It offers sharing features that lets other people viewing and editing your shared notes. Simplenote has a versioning feature which allows you to restore previous versions of your notes. You can also download all of your notes in zipped text format to keep a local copy. Do you need a little but handy note taking tool? SilverNote could be the solution. The software comes with lots of note tools that can assist you to create notes conveniently. It has both free and pro versions. Currently it supports Windows computers only. SilverNote does not require an account to work with. So just download the app and start taking notes. You will find a big deal of formatting options in the text editor box. You can draw with built-in pencil tool and fill specific area with color to better illustrate ideas. Creating a to-do list in SilverNote means just making some bullet-text points. No checking box available here. Insert images, screenshots and other files in your notes to make it healthier. Exporting those notes are just a matter of clicks. You need a pro version to do it though. 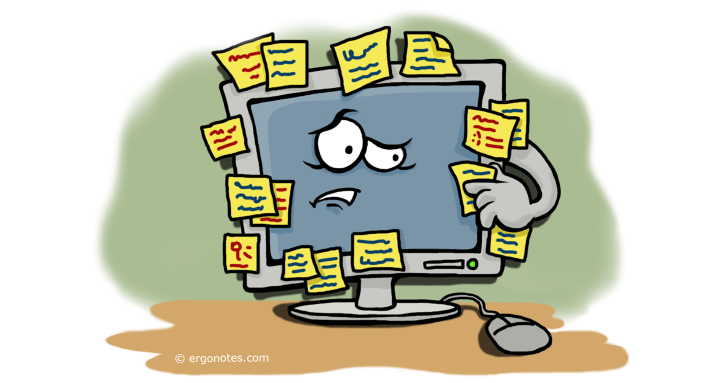 SilverNote lacks a native online synchronization feature. But still you can sync the note repository with Dropbox, Google Drive and so on to get access from your multiple PCs. If you compare SilverNote with other high profile note taking apps like Evernote or OneNote, the missing sync feature will appear boldly. But in case of note creating and features, SilverNote is a good competitor. Did you use Beyondpad.com? The service introduces itself as the data driven note taking tool. Currently it offers web version only. The service has add-ons for Chrome and Firefox. Beyondpad author promises to make it available on mobile platform in future. Until then, you may like to give a try to the web app. Beyondpad notes interface looks similar to Google Keep. It has analogous tiles structure. The text font color can’t be changed. Like Google Keep, the note background color is customizable. The service also lets you creating a visual reminder using its timer and stopwatch options. Beyondpad plays with tags. Here you can insert a tag into another tag. Again, tags also can be linked to notes to store information about the specific tag. Boards and Trackers are two of the most discussed features of Beyondpad. The Board is something like the ‘Pinterest’ of notes. Here you can put selected notes which can fine-tune their tags with other adjustments. Trackers are applied in keeping an eye on project stuffs like expenditure, revenue, reserved materials etc. You can set timers and see the tracking item’s status inside Beyondpad. The service does not allow image uploads. Still you can put images inside your notes by pasting their links and the image will be shown on the note body. … And this was in my collection for now. I hope you will find this post useful to choose the right note taking tool. So, which one would you pick as the best choice? Check out Centrallo (www.centrallo.com) as well. Plok.mn is also a tool to keep in mind.